← How to convert tiff to png and specify output width and height? VeryPDF OCR to Any Converter Command Line can also be used to fix image like deskew, despeckle and noise removal, auto-orientation, dithering, black border removal. This function is helpful for those scan files, fax files as there may be some slop or dirty once after scanning. In the following part, I will take despeckle image for example to show you how to use this software. As this is command line version software, when downloading finishes, there will be a zip file. Please extract it to some folder then you can check the elements in it and call it from MS Dos Windows. Also there is GUI version of OCR to Any Converter available, if you would not like to use command line version, please use the GUI version. When you process image and despeckle image, please refer to the following command line templates. By this command line, you can deskew tiff and remove noise in tiff image file. 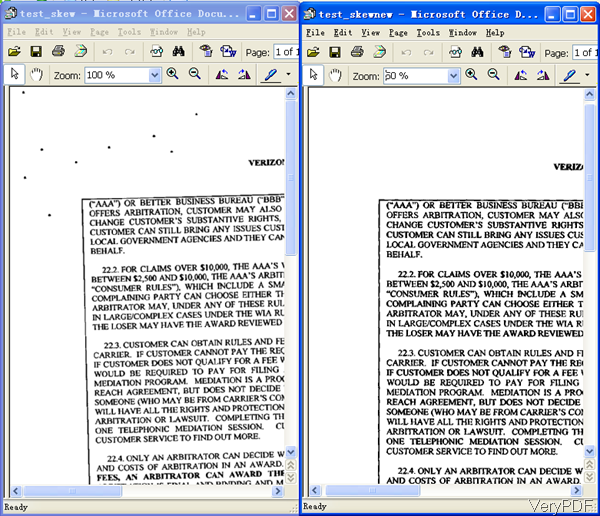 By this command line, you can also deskew tiff and remove noise in tiff meanwhile rotate PDF in 45 degree. Same with the above one, you can rotate input png file in any degree. Meanwhile you can convert png to tiff file format. Here is an example of converting tiff to bmp and set the threshold automatically according to the image file. This example show you how to convert tiff to bmp and set threshold at 240. The above two command line templates can be used to convert bmp file to png and convert the color image to B&W by adjusting dither values. If you need to check more examples and usage, please visit readme.txt. Now let us check the related parameters. -imageopt : deskew and despeckle images automatically. This parameter is the key element of despeckle image. Now let us check the despeckle image from the following snapshot. Deduce from the above instruction, we can get that this software can help you change image file format and despeckle image. During the using, if you have any question, please contact us as soon as possible. This entry was posted in OCR Products and tagged despeckle image. Bookmark the permalink.